Whether you're hauling across town or across the country, the RHA-350 has the power you need and the safety and comfort you deserve to get the job done. Though a SportChassis resembles an 'over the road' truck, it is considered a class 5 vehicle, requiring no special license. The M2 chassis from Freightliner is designed for heavy-duty towing capacity mile after mile. Their philosophy and ours are simple, start with the best and you can only go up. Each of the RHA-series trucks features a proprietary hauler style bed designed to be just as rugged as you are. Using our industry experience building emergency rescue vehicles and ambulances, we apply the same design principles and construction materials and techniques that perform under the most rugged conditions and tests. The hauler bed design is completely fabricated from scratch in our 293,000 square foot facility. Utilizing CNC precision routers, proprietary rail designs and materials, our team of talented men and women create a truly remarkable and long-lasting product. SportChassis is unique among other manufacturers. The parent company, SportChassis LLC is a licensed OEM completion company. This means there is no middle man between you and your vehicle. We receive a bare cab-chassis directly from the Freightliner plant in Mount Holly, North Carolina. Our engineers in conjunction with Freightliner engineers have created a set of proprietary designs specifically for SportChassis. Not only is there a cost savings to you, the end user, but this keeps modifications to the chassis at a strict minimum and ensures that our designs have been vetted to the highest safety and performance standards. No matter what you decide to pull down the road, a SportChassis makes sure you can get where you need to go. Our luxury interiors, award-winning design, and dynamic acoustical environment make sure that getting there is more than half the fun. The Detroit™ DD8 is built proudly at our legendary production facility in Detroit, MI. The DD8 features the latest in engine technology to go along with the know-how and quality you’ve come to expect from Detroit. From the sturdy design of the ribbed cast iron block to the advanced common rail fuel system the DD8 delivers the reliability and performance you demand. With our industry leading maintenance intervals and our innovative Detroit™ Connect Virtual Technician℠ remote diagnostic service the DD8 was designed to help you maximize uptime. THE NEW DETROIT DD8 DELIVERS WHEN IT COUNTS. ISL9. Power To Tow, Power To Go. The Cummins Aftertreatment System has been proven for years and thoroughly tested under the most extreme conditions. This proven system consists of a Diesel Particulate Filter (DPF), Selective Catalytic Reduction (SCR) and a dosing system for the Diesel Exhaust Fluid (DEF). Designing and building the package in-house allows Cummins to calibrate the engine and aftertreatment system for optimum fuel economy, performance and near-zero emissions. 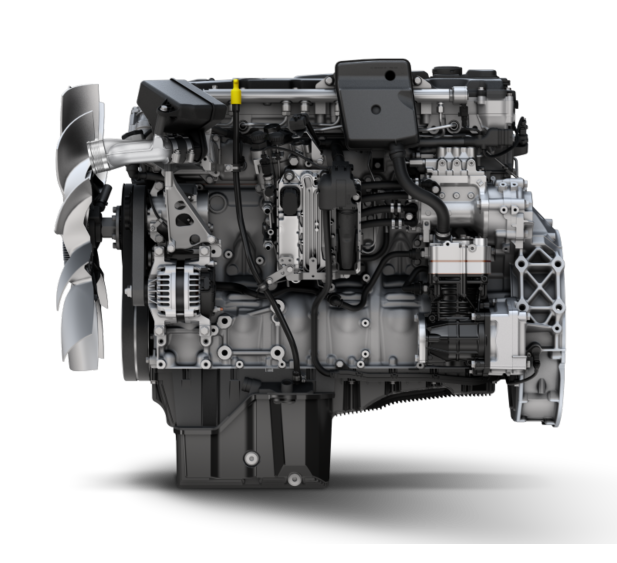 The power range has been expanded, as the ISL9 adds ratings previously offered in the ISC8.3 from 260 hp to 380 hp (194-283 kW). Optional features include engine braking for better control, Rear Engine Power Take-Off (REPTO) and Front Engine Power Take-Off (FEPTO). Maintenance intervals remain unchanged. The ISL9 is one of the major reasons that Cummins engines are an industry favorite in medium-duty and vocational trucks, including dump trucks, mixers and refuse haulers. The ISL9 delivers better. Every truck.